Over the past several weeks, I’ve had the opportunity to attend and participate in several conferences and meetings, most notably the National Partners in Community Forestry Conference and the California Association of Nonprofits Annual Policy Convention. These meetings were an opportunity to connect and learn from my peers in both our field of urban and community forestry and the nonprofit sector. It’s often difficult to step away from our day-to-day responsibilities to attend these types of meeting and learning opportunities, but I firmly believe that we must make the time and prioritize being an engaged and active member of our “networks”. At the Partners conference in Pittsburgh, data and metrics rang loud and clear. Tree Pittsburgh and the City of Pittsburgh are doing an amazing job of systematically working through their Urban Forest Master Plan. 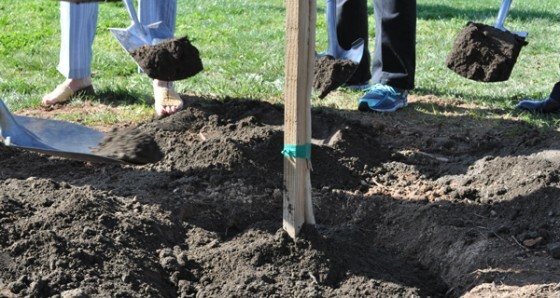 The plan provides a shared vision for the community to grow and care for their urban tree canopy. The second takeaway for me was that we are doing amazing work in the communities that we serve and must tell that story. Jan Davis, Director of the Urban and Community Forestry program for the US Forest Service, summed it up nicely with “we are changing the map”, meaning that we are truly transforming the cities and towns we work in. Finally, having everyday contact with nature, trees and greenspace has a profound impact on our health and well-being. I know first-hand that a daily walk in the park near our office or the tree-lined streets of my neighborhood make a huge difference in recovering from the pressures of work and life. Stop and smell the trees! Last week in San Francisco the California Association of Nonprofits Convention offered a chance to connect on a different level, a chance to learn and share with my peers in the nonprofit sector. The highlight of the day was definitely the keynote address by Professor Robert Reich, former United States Secretary of Labor and star of the new film Inequality For All (go see it if you have the chance) who did a phenomenal job of breaking down the economic crisis, recovery (or lack thereof) and what it means to work in our sector. Bottom line, the work that nonprofits are doing is vitally important to the economy and to making society work; there will in an increased burden put on our work as our country’s demographics continue to change. Going into the new year, we have some exciting ways you can continue to connect with California ReLeaf and your fellow Network members across the state, including the Network Advisory Committee, webinars and face to face meetings – stay tuned! Make it a priority to engage, share and learn from your peers. Joe Liszewski is the Executive Director of California ReLeaf.